What is a Chrysler LeBaron? A particularly ‘compact’ sporting 2+2 coupe from the Pentastar stable, that’s more European in styling than Yank, and brimming full with so many options that makes the phrase ‘fully loaded’ almost an understatement. Forget all your preconceptions about V8-powered Detroit gas guzzlers, this just isn’t one of them. In fact, perish the thought, it hasn’t even got a V8 engine, it’s front wheel drive too, and extremely economical when it comes to fuel consumption. Available as both a fixedhead coupe and convertible, the LeBaron was a big seller in the USA enjoying a nine year production run, and nowadays is quite popular with UK owners as a second car, and indeed is one of the cheapest ways of getting into American car ownership after the Mustang Mk3. 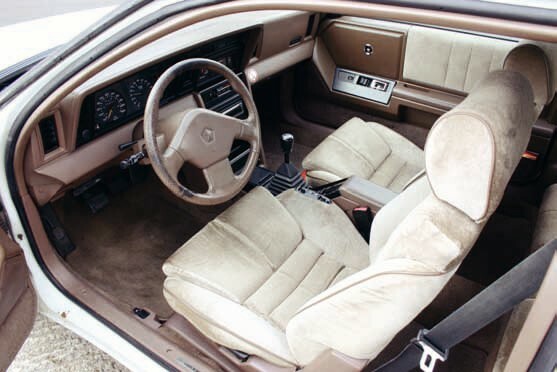 While the LeBaron may never be deemed to be ‘collectable’ it has a strong enthusiastic following, and offers incredibly high levels of refinement in a car so small and inexpensive to purchase. The LeBaron name has been part of the Chrysler line-up of models since 1977 when it was a rather boxy M-body on a 112.7-inch wheelbase and in the early days did feature a V8 engine. New small cars were the way to go as far as much of the American buying public were concerned and they sold well. It was the time when Lee A. Iaccoca (often referred to as the ‘Father of the Ford Mustang) joined the company as chairman, and its fortunes were very much in need of restoring, and in time they were. Early LeBarons were rather nondescript and bland in the styling department and didn’t exactly have much wow factor. However, in 1982 the ‘Ragtop’ model was introduced, the first in the USA car industry since the mid 1970’s, with revised frontal styling complete with rakish headlamps, and the newly designed 2.2-litre SOHC four-cylinder engine, and 2.6-litre courtesy of Mitsubishi arrived on the scene. In 1984 the 2.2-litre got a turbo and power output was a fairly healthy 146bhp. Additionally a 2.6-litre engine option supplied by Mitsubishi was also available. There was even a LeBaron Town & Country model with that very American ‘Woody’ theme, only this time it was wallpaper wood and plastic… and an acquired taste? By the mid 1980’s the LeBaron had become even more attractive, keeping the same rakish headlamps, which were now enclosed under a cover, though the only fly in the ointment for some was the concave effect finish of the lower door extremities that does look rather odd. Variations of the LeBaron included the GTS sedan with five-door hatchback bodywork, quite a practical model, but not having the same kudos as the top of the range GTC turbo coupes and convertibles, based on the J-body introduced in 1987. Their interiors are quite plush, nicely trimmed including the door cards and to the rear are individual bucket seats. There was no stinting in the braking department either with discs all round and attractive lattice style 16-inch alloy wheels. When new, the LeBaron sold for around $14,000 and some dealers at shopping malls in the USA offered His ‘n’ Hers deals with red and white painted cars and you got the second car for half price! The Americanism ‘fully loaded’ definitely applies to the LeBarons with some features that would normally be found on much larger luxury saloons. Options like illuminated vanity mirrors built into the sun visors both sides, illuminated entry system whereby you press the door handle and all the interior lights come on. Then there’s a light on the steering column which shows you where to insert the ignition key, Power Enthusiast Seats which have just about every adjustment you could ever wish for. The rear seats fold flat for the stowage of longer items, there’s an overhead console with storage for sunglasses, the remote for your electric garage door, twin map reading lights, outside temperature and compass LED display, there’s heated wing mirrors, cruise control, air con, the list is seemingly endless. The LeBaron turbo coupes and convertibles with five-speed manual transmission offered fine handling and performance with economy, and anti-lock brakes arrived in 1992. So did new a new engine with the 2.2-litre four-cylinder dropped in favour of a 141bhp Mitsubishi V6. 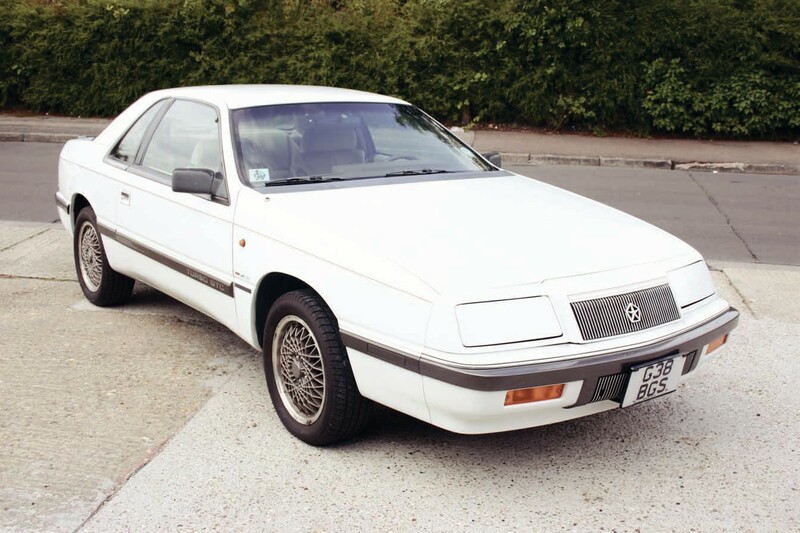 The LeBaron even spawned the Chrysler TC Maserati, with a 200bhp 2.2 Maserati designed twincam cylinder head no less, but it wasn’t a great success, being much more expensive and looked too much like the cheaper LeBaron. The last of the line came in 1995 when the model was replaced by the Sebring, a model derived from the Japanese Mitsubishi Galant! The LeBaron is quite a lively performer, nimble and will suit your requirements very nicely whether you’re nipping down to the shops or long distance touring. On a long run it’s quite possible to obtain as much as 40mpg, and even urban driving should return 25-30mpg. The on-board trip computer will give you all this information. The interior offers high levels of comfort and in addition to multi adjustable seats you also have a tilt steering column to ensure you find that perfect driving position. Four wheel disc brakes ensure excellent retardation, there’s power steering and the turbo boost gauge will keep you informed at what’s happening on the performance front. Cars from 1990 onwards with the V6 will also offer excellent acceleration, but make sure gear changes from the automatic transmission are as silky. Listen for any clunking noises from the FWD due to tired CV joints and don’t forget to make sure the rubber boots are not cracked or split. Entry level for a tired late 1980’s GTC coupe can be as little as £500, but is it really worth the trouble when you can source a much better one for around £1000-£1500? If you want a convertible you can purchase the best for a mere £2500. Last of the V6 cars will be a tad more. Fortunately rust isn’t a serious problem on the LeBaron, the steel unitary construction is of pretty good quality though the dreaded tin worm can be partial to areas around the bottoms of the doors, sills, and wings. Other areas to inspect will be around the A pillars of the windscreen, and make sure the sunroof drain holes aren’t blocked either. In essence just look for the normal areas of rust that you’d expect to find on virtually any car. Any LeBaron model that’s been well neglected both bodily or mechanically isn’t even worth considering! With superb examples available for £2500, don’t waste your time and money repairing bodywork or restoring running gear on a banger. Turbos can sometimes give trouble, they can crack, breakdown internally, a tell tale sign can be puffs of smoke from the exhaust due to oil leakage, so make sure all is well when on a test drive. Replacement engine and front drivetrain components will work out more expensive than say rival Chevrolet or Ford prices for example, so ensure everything is serviceable. General availability of running gear replacement parts shouldn’t pose any problems, but sourcing interior and exterior trim may prove more difficult, and almost certainly will have to come from the USA. It’s worth making sure all the electrical toys, bells, and whistles on the car are all working, as it’s not going to be cost effective to start trouble shooting and repairing those that are unserviceable. You’ll be purchasing a car that’s pretty damn cheap in the first place, though you won’t want to have huge repair bills sorting the electrics. Ensuring that the air-conditioning is working is an obvious tick on your check list, as is making sure the pop-up headlamps do just that. They are operated via electric motors which in time can fail and require replacement. There is a manual override lever located under a flap on the bonnet slam panel by the way. The Chrysler LeBaron could be the cheapest way into American car ownership and you’ll be seriously impressed with the levels of refinement and options. It may not be a collectable V8-engined Yank with huge charisma and presence, but with the price of petrol on the increase and 40mpg on offer on a run, who’s grinning now when paying the cashier? The convertible will be the most desirable model in many eyes with its neat stowage at the back - choice is yours. Whatever car you go for, purchase the best you can possibly find for cheap Yank thrills. The car photographed in our feature is a 1989 2.2-litre turbo GTC and is for sale at £1200 ono. Contact Irving 07944 632 212 for full details. Bit of a surprise to see my car here (yes... G38BGS is mine) considering I've owned it since November 2010, and this article is dated April 2011. Still.... As the owner I can assure you, the article is very accurate. Especially the bit about expensive drive-chain components... I just has Second, third and fourth gears replaced at a pretty four figure cost. Thankfully I only paid low hundreds for the car, so all in, it's worked out well. Having finally got the Chrysler back, after an long, frustrating and very expensive parts search, I would like to add the following warning. Gearbox internals for the GTC manual box VERY scarce, if you are looking to buy a manual box Lebaron, be VERY wary of any gearbox noises or stiffness in changing up and down. INSIST on a test drive of at least five miles, and make sure there are plenty of gear changes. There are plenty of Automatic LeBarons about, so unless you are really hooked on manuals, I'd put serious thought into buying an auto.